With a Cisco Unified IP Phone, you can help your business benefit from the productivity-building capabilities of next-generation communications and collaboration, which now includes Multimedia Video and Voice Communication. These industry-leading IP endpoints are designed to maximize network powered communications and collaboration. Cisco IP Phone provides a comprehensive portfolio of wired and wireless IP handsets from basic lobby phones up to video enabled touch screen executive models. Models with the Cisco proprietary protocols are designed for deployment with a Cisco call processing server such as Callmanager or a Callmanager Express router. Phones with the SIP protocol can be configured to work with open source systems supporting the SIP protocol. This series of phones includes models with the same basic features, but the phones are distinguished by their line capacity, which ranges from two to 12. 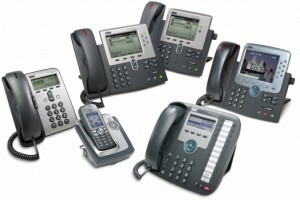 The Cisco 6900 series phone offers lighted hold and menu keys as well as a lighted call-waiting indicator. The series includes a speakerphone and interface for headsets. This entry-level phone offers a graphical display that can display basic images such as a corporate logo. The display also features scrollable menu selections to access additional features. The 7900 series includes a large number of models for specialized business needs. A brief survey of these models includes models 7910, 11 and 12. These phones are sets that offer minimal features. 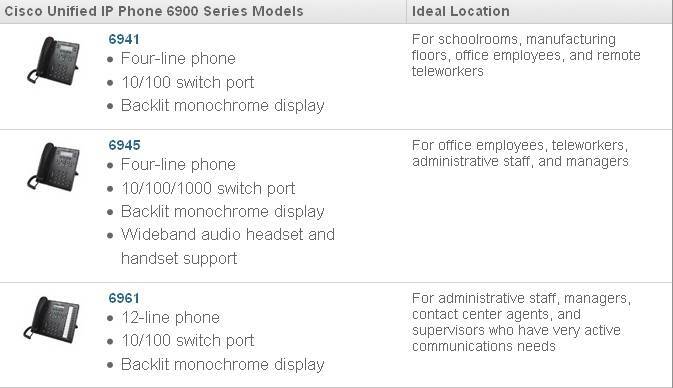 The phones in this model line are designed for common areas such as lobbies, classrooms or individual cubicles. The 7920 class includes all phones designed for mobile use. They are wireless models that connect to networks via the 802.11b and 802.11g protocols. The 7935, 36 and 37 are conference-station models that include external microphones and features suited to conduct corporate conference calls. The 7985 is a videophone that includes a high-quality camera and XGA computer LCD monitor. This series is described by Cisco as “an advanced professional media endpoint that delivers an enhanced user experience with an easy-to-use and eco-friendly ergonomic design.” These phones feature high definition voice and video quality with a fast gigabyte network interface. In addition, they include VGA color computer-style displays and an external USB port. The 8900 series hosts a full feature set including programmable buttons, LEDs and the ability to handle as many as five call sessions simultaneously. This series makes up Cisco’s highest-end phones. The series is described by the company as “an advanced collaborative media endpoint that provides voice, video, applications and accessories.” The 9971, for example, features video conferencing as well as wired or wireless operation through 802.11g and Bluetooth. The LCD touch screen offers VGA resolution for ease of use and customization. These phone models are designed for high-end corporate executives and business administrators. Easy to use yet packed full of features, Cisco VoIP phones are a strong and integral part of the increasing trend to converge all forms of business communication into one network. Affordable, reliable, and stylish, Cisco phones will provide your home office or small business the traditional communication capabilities you use every day and provide future-proof adaptability to add new collaborations. 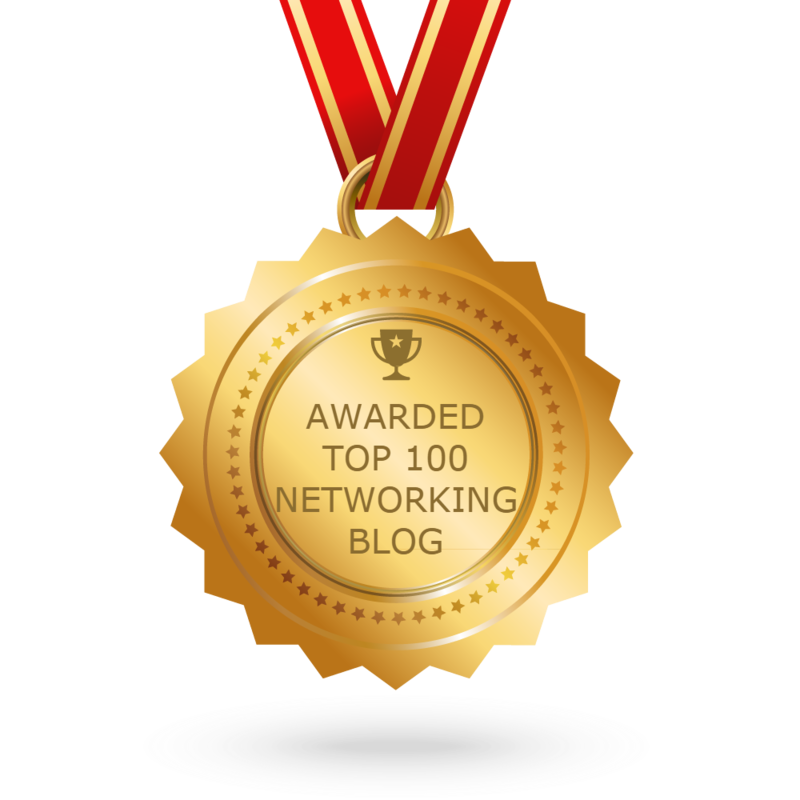 Save time and money by managing only one IP network for both data and voice. Deploy a phone system anywhere that has broadband internet access. Supports Power over Ethernet (PoE), hosted IP telephony service, IP PBX, and Bluetooth and Wi-Fi.